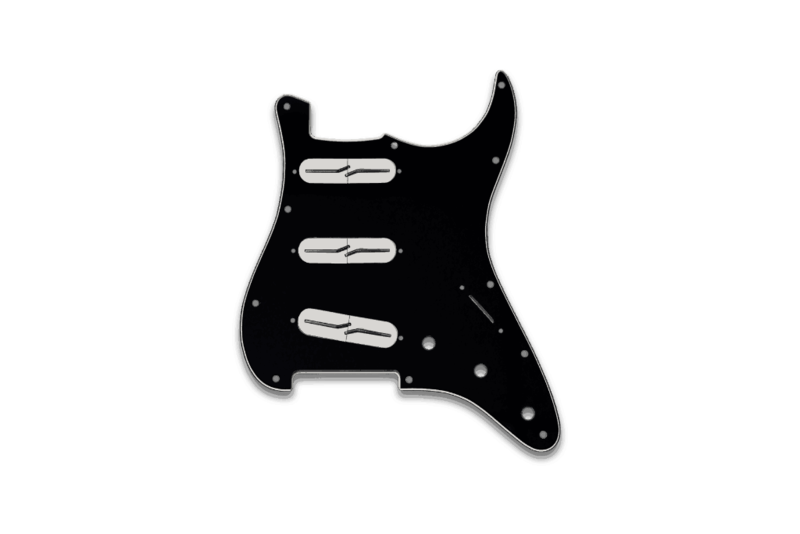 Our Pre-Wired Strat Pickguards are the perfect product for anyone who wants the Fralin Tone, instantly. We use the finest materials available: from CTS® Pots, AllParts® Pickguards, and CRL® Switches. With a few short steps with a soldering iron, you can be rocking out with a new look, and the best tone you can find, instantly. Most vintage-style guitars are using the Round radius. Modern guitars are usually using a Medium radius. Guitars with a very flat fingerboard work best with the Flat radius. We will hook you up with 2 tone caps if you choose two tone pots. We recommend choosing two different value caps for ultimate tonal variation. Please use the notes field on the checkout screen to tell us which tone cap goes where. For instance, you may want a .02mfd Master Tone in Tone 1, and a Magic Cap in Tone 2. Customize your tone one step further with push-pull modifications. We have Plastic Knobs available – these will work for Split Shaft Pots only. We can provide the Tremolo Spring cover to match your pickguard choice. These have 6 Holes for your strings to go through. PREWIRED PICKGUARDS – The Fralin Way. We wanted to use the highest-quality, USA-Made pickguards available. We have Single Ply White (8-hole vintage style), 3-Ply White, Mint Green, Parchment, Black, White Pearloid, Parchment Pearloid, and Tortoise. With our pick guards, you can choose any combination of pickups you would like. Want a Vintage Output in your Neck and Middle and a High Output in your Bridge? Sure thing. Simply choose what you would like, and we’ll make it to your specifications. 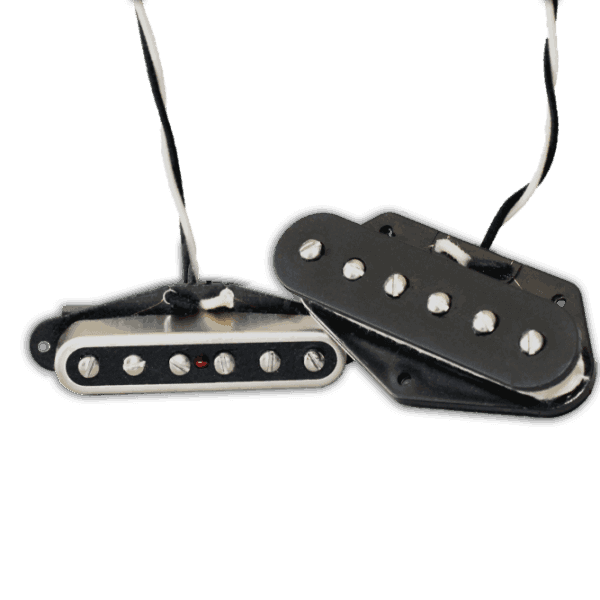 Determining the pickup outputs and pot values are really important for a great sounding guitar. Vintage Output and High Output Split Blades usually sound best with 250K pots. Blues Output and Super High Output Split Blades usually sound best with 500K pots. We don’t necessarily recommend mixing Blues and Vintage together – they will sound noticeably different. Lindy Fralin Split Blades that use 250K Pots. Our Split Blades come in two colors: White and Black. Our White is slightly off white, with a hint of cream. You can customize your wiring, and we’ll wire your pickguard to your specifications. Most of the time, you’re going to use 250K Split Shaft Pots, as these work well with our plastic knobs. If you’re using your own metal knobs with a set-screw, choose Solid Shaft pots. Confused? Check out our in-depth article on pots and how to choose here. Note: Vintage and High Output Split Blades like 250K Pots, and Blues and Super High Output models like 500K Pots. It’s best to use these as a set: for instance, a Vintage Output in the Neck and Middle, and a High Output in the Bridge. We have White, Parchment (Aged White), Mint Green, and Black Knobs available, and White and Black available for the Split Blade colors. Note: we only have plastic knobs available. If you choose Solid Shaft Pots (for metal knobs) please understand that metal knobs are customer provided, and we will ship your order without plastic knobs. Check out our installation guide below to put your new pick guard in! With 20 minutes a few easy steps, you can get your pickguard in your guitar and start rocking out with some of the best sounding pickups in the world! Also, download our installation guide here. How long will my Pickguard take? Since we’re building it from scratch, give us about one to two weeks to put it together. We will always try to get it out beforehand. Can you wire it up without the Pickguard? As it turns out, No. Simply purchase an inexpensive pickguard, and you can pull out all the wiring once you receive it to put it in your own pickguard. It’s just too time consuming and unsafe to ship without a solid pickguard holding everything together. Can I return my Pickguard? No. 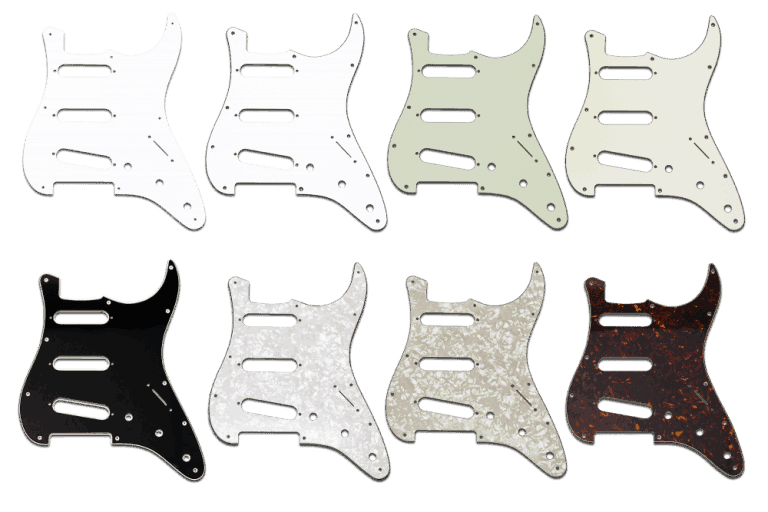 Since these are so custom and made to order, all pickguard sales are final, and not available for exchange or return. What Pots should I use? Most of the time, 250K Split Shaft pots will work best for guitars with single coil pickups and plastic knobs. If you have metal knobs at home, go with Solid Shaft Pots. What does a Magic Cap do? Our Magic Cap is a very low capacitance tone cap. It doesn’t roll off highs as much as it seems to boost the mids. This really works well on the bridge pickup only. What does a Blender Pot do? Our Blender Pot takes the place of Tone #2, and it allows you to blend between the Neck and Bridge. You can get all 3 pickups on with a Blender pot. Why don’t I see Ground Jumper wires between all my parts? Our pickguards have a metal shielding that connects all of the metal parts together, thus we don’t need to use jumper wires. This is my 3rd set of Fralin pickups. 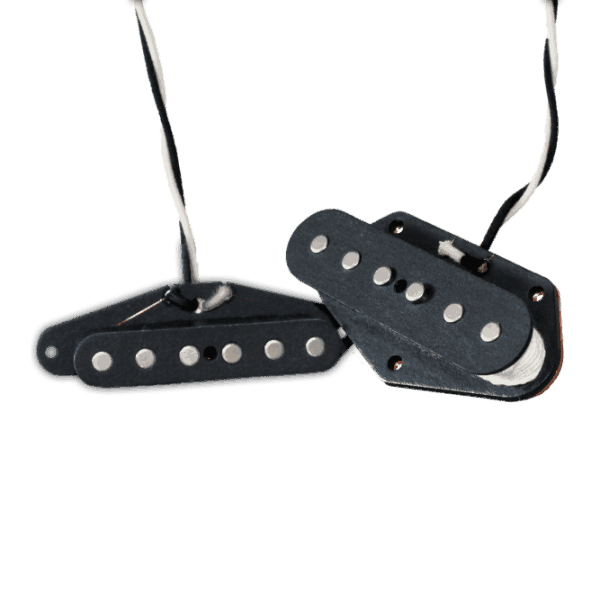 Simply put, they are the kind of pickups that inspire you to play your guitar. Great work Lindy & company! Thank you for your amazing pickups. I ordered the Vintage/Vintage/High Output with the Volume Kit on parchment pickguard for a Road Worn Strat that was, frankly, just a backup guitar for my nicer guitars. I also put in a better bridge and block. I was blown away by the tone of these split rails! I’ve used MANY rails/hum cancelling single coils before, but they always sounded either like straight humbuckers or were missing the vibe of single coils. These pickups sing! They are warm, but still have more highs than other rails I’ve used. I can’t put this guitar down. I’ve used it on all my amps and it sounds great on all of them. The wiring job was immaculate, but I knew it would be as this is the 4th pre-wired pickguard I’ve ordered from here. These pickups are the real deal. I use them on pretty high gain amps straight in, no pedals, and noise was an issue. These pickups have solved that problem with great tone to boot! It looks great and sounds even better. A thick tone and really reacts well to different pick attacks. Still maintains the sound of a Strat, but thicker with a little more bite. Love the quack of the bridge/middle combination. I have a 91′ Telecaster that I bought new in Enid Oklahoma. I have played the Grand Ol’ Opry in Nashville 3 times with various artists with this guitar and have always loved the action and feel of the neck. I have never been satisfied with the Fender stock pups and have gone thru many amplifiers searching for the *magic tone*. A couple of years ago I installed EMG T-System pups, and man, they sounded great! Fat, warm, but still the Telly spank. However, they sounded awful thru my effects units as they were active pups.. A friend told me about Lindy and how he had made some custom pickups for him and he loved them. I sent an email to the Frailin web sight and got a call from Zak. I told him what I was looking for and he recommended the split blade, high output pup. A side note: I had decided to tun my Telly into an Esquire, with just one pup. The pup Zak designed is amazing. Bridge is just straight out, no tone control. Middle position has a cap, and tone control. (which is killer). The neck position has the magic cap and no tone control. Honestly, its a bit midi for me, but the other two positions make the one pup sound like three! Would love to upload a pic of this thing. I am playing clean country guitar, thru an all tube Supro Thunderbolt, 15″ speaker. Adjustable wattage, 35, 45, 60. Sounds amazing. Thanks to Zak for the design! Keep it up boys! very helpful in picking out the right setup. Highly recommended. Great pickups and quality – I love them! Hi Lindy.The Vintage split blade pickups are just amazing. My Grandson received them as a Christmas gift from me, and he couldn’t happier. They truly live up to the reputation. Thank you. These are my 2nd set of Blues split blade pickups. The first was purchased in 2012 and now 2nd set in 2017. The improvement in both of my Stratocasters is amazing. Clarity of notes, string to string balance and sustain are all improved 100%. This last prewired pickguard came with a blender pot and a push pull tone pot. Both of these options add a significant increase in tones that can be achieved and make the guitar even more versatile. These are by far the best pickups I have used in my Stratocasters eg: Carvins, Fenders N3’s, Fender Alnico, Kinman Avn Blues set, Fender Texas Specials, DiMarzio Area pickup set. Although the aforementioned are all good pickups they just don’t compare to Fralins IMHO. I also have a set of Split blade Jazz bass pickups also same high quality 100% improvement in tone over the stock Fender pickups. Also like to say that Lindy is a gentleman and pleasure to do business with as well as the other members of his company. Customer service is excellent!! Next pickups for my Tele project!